Jays in the House: Is Kendrys Morales a legitimate option at first base? 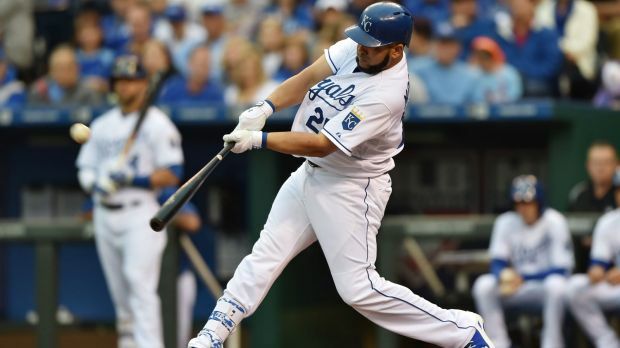 Is Kendrys Morales a legitimate option at first base? There has been a lot of discussion regarding the Kendrys Morales off-season signing. The Blue Jays gave him 3 years and $33 million early in the winter to slot into the middle of the line-up, giving them a switch-hitting power presence. This move has definitely come with it's fair share of criticism. Among baseball writers, Dave Cameron of FanGraphs has been vocal against the move, questioning the signing even before the market for no-glove, power bats collapsed this off-season. He continued to critique the signing, naming it the second worst transaction of the entire off-season. Among Jay's fans, the move has also been widely criticized, mainly because Kendrys Morales isn't Edwin Encarnacion. Watching the parrot fly south for $27 million more than Morales signed for, to the team that eliminated the Jays in the ALCS has been a PR nightmare for the new management. So much so, it led Eddie Rogers stepping in to ensure the Jays save face and re-unite with franchise icon Jose Bautista. It's not fair to Morales to compare him to Edwin, though I feel that may be a narrative among fans as the season goes on. Kendrys Morales is a very good hitter. He was signed to be a good hitter. He's projected to hit anywhere between 23-28 home runs, and I think that number can get over the 30 mark, Two straight years of line drive rates over 20%. Kaufman is definitely a more spacious park than the Rogers Center, so there is reason to believe his power will play up here. Eno Sarris predicted that he will surpass his career high in homers. The big disconnect between his estimated contract ($20/2 FG Crowd-source, $22/2 by Cameron) and his actual contract ($33/3) was essentially the extra year. The age 36 season of Morales definitely adds downside to the contract, but that's generally how the open market works. The negative value associated with Morales ties into the negative value he brings on the bases, and the non-existent value he has defensively. The Royals had no intention of using Morales on the field last year, and it appears that ol Gibby feels the same way. When Morales was originally signed, comments from Atkins seemed to indicate something different, saying that he could see a "good deal" of time at first base. It's entirely possible that is just posturing, as most of the off-season continued with free-agent speculation. If he was able to play league-average defense at first base, it would enable the Blue Jays more positional flexibility throughout the season. He would be more valuable as a first baseman than strictly a DH. Early reports indicate the team is leaning towards Steve Pearce as the preferred option in left field. I still think that Melvin Upton is very much in the picture, and will likely play the outfield against left handed pitching, at the very least. That would leave the decision between Smoak and Pearce for first base, unless the club is actually serious about giving Morales a shot at first. The question then becomes, how bad could he possibly be? First things first, he broke his Fibula celebrating a walk-off grand slam in 2010. It's probably correct to seperate his defensive production from pre and post injury. From 2006-2010, he logged 2342.2 innings at first base, UZR had him at 16.1, and he put up a cumulative of 17 defensive runs saved. I was actually surprised reading that before his leg injury, he was an above-average defender at first. When he came back, the Angels had already replaced him with Pujols. In 2014 the Twins had Mauer, and for the past two years Kansas City has had their own overrated first baseman in Eric Hosmer. There was little need for Morales to do anything but hit. Since 2010, he's recieved a total of 853.1 innings at first base. UZR has him at -0.7 in those, and DRS doesn't love his work either. I could be reaching here, but I could see him doing enough at first that allows the team to free up the DH spot, depending on how the final roster shakes out. It's not like our incumbent first baseman has a stranglehold on the position. Speaking of the incumbent, let's have a look at his defensive metrics. Smoak's career UZR/150 is 0.2, and over his career he has posted -16 defensive runs saved. The metrics don't appear to love his glove-work, despite having the reputation as a good defensive first baseman. However, last year, in a playoff race, we slotted in Encarnacion over Smoak in order to optimize the lineup and DH a combo of Donaldson and Bautista. The metrics actually preferred Edwin's glove over Smoak (636 Innings/0 DRS/1.7 UZR to 732/-5/-1.6). How many play-off at bats did Smoak receive? None of the projection systems seem to like Justin Smoak. All 3 project him to be under 20 HRs, 100 wRC+, and just barely over a win. ZiPs being the highest on him at 0.2 wins, over the course of just under 400 at-bats. To put it bluntly, I don't see any reason why a contending team would be giving Justin Smoak that many at bats. If he wasn't still owed 2 years and $8 million, his spot on the 25 man roster would be in jeopardy going into camp. I'm not buying the spring narrative of tapping into the upside of his former top prospect days. Going into his age 30 season, I think that what we've seen from him is about what we should expect this year. He had a wRC+ of 8 (career 81) against left-handed pitching last year. With the amount of right handed options on the team, there really shouldn't be any reason for him to bat right-handed at any point. The Red Sox won the division last year with Hanley Ramirez spending the whole year at first despite never playing there in his career. He posted a -5 DRS and -3.5 UZR, which was actually a significant upgrade from his earlier attempt at being a left fielder. Morales has been an above-average defender at first before, yet no team has really given him an opportunity to play first after his broken fibula. If Morales can manage to play roughly league-average defense, it would allow him to play first on a semi-regular basis. Morales at first would mean seeing less of Justin Smoak, and that can only be classified as a good thing.